BANGI, 8 Jan 2014 – Rural women in Sri Lanka chose not to use the internet or learn computer skills because of low relevance and benefit to them in their daily lives. A University of Colombo lecturer and PhD student at the Faculty of Social Sciences and Humanities (FSSK) at The National University of Malaysia (UKM), G.T.I Maduhubhashini said internet usage in her native Sri Lanka is at a very low 13.1% for the entire island with the rural women accounting for only 1.1% of that. Making her presentation on “Issues in Internet Adoption Among Rural Women in Sri Lanka” at the Tun Fatimah Hashim Discourse Series 2014, she said even urban women have no motivation to get online as often as women in other developing countries. This could be due to the lack of infrastructure, affordability and computer skills. She said even university campuses and public places have very low internet accessibility causing staff and students alike to become less attracted to get online. The Sri Lanka government had introduced ICT Centres in rural villages but have gotten no positive feedback from the villagers. “There are many ICT Centres being built by the government, but no one comes to use it. They feel that the internet cannot help them in their daily lives, so why bother learning?” Maduhubhashini said. 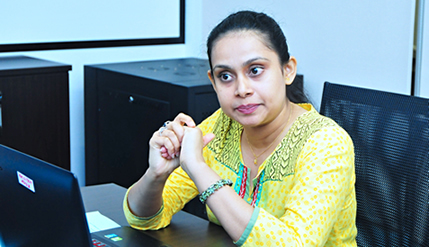 In the discussions that followed, Director of the Tun Fatimah Hashim Women’s Leadership Centre, Assoc Prof Dr Madeline Berma felt the Sri Lankan government should re-think its ICT policy. Dr. Madeline said the government should create ICT programmes around the ICT centres that is relevant to their daily activities which will benefit the rural community. “Just building the centres and turning on the WIFI on won’t make the people suddenly interested in the internet. They need to learn how to operate the computer, adapt to the main language of the internet – which is English – and most importantly, it has to be tied in to their daily lives or else they will never be interested in getting online,” Dr Madeline said.